At Marellan Shorthorns we believe genetic progress is made by using the best genetics possible, making long term decisions and applying the correct selection pressure. As stud breeders we endeavour to have a deep respect for the art of breeding cattle, consequently we don’t want to cut corners. Genetic progress is more often a long term result of making wise breeding decisions generation after generation. We are totally committed to submitting all our performance data to Breedplan for an external evaluation, but we refuse to play the short term ‘figures game’. Long term traits such as longevity and optimums are not ignored at Marellan. Longevity (when accompanied by year in year out reproduction), is arguably the most profitable trait in a cow herd, but it is also takes the longest time to select for. Cattle that cannot survive and prosper in their environment are of little value. Since our herd’s relocation to Central Queensland, our ability to breed for the Northern environment has sharpened. For example, we are now able to assess our cattle and make breeding decisions based on tick burden. The right Shorthorn has proved their worth in the Northern Beef Industry for over 150 yrs. Over time we anticipate that the tropical focus of our herd will further increase our Northern Relevance. Like all environments, central Queensland has good seasons and bad seasons. We firmly believe that cattle need to have quick finishing ability (the ability to lay down fat) to reach market suitability and to function as breeders. Condition allows cows to continue to function in the ups and downs of seasons. Marellan bulls are bred to give our clients more market options. Market versatility is a definite key to profitability. We keep a very close eye on meat quality whilst remembering that performance and speed of finishing are essential traits. Marellan Shorthorns are unique in their ability to increase performance (often through Hybrid Vigour) and meat quality at the same time. Marellan Shorthorns are bred to be grass performers with a feedlot option. We believe this grass bias is correct, as grass is the production system of virtually all, and the finishing system of most. This said, our genetics are award winning feedlot cattle. We now have clients with Bos Indicus cows that are now accessing MSA premiums for the first time with their Shorthorn sired cattle. Our bulls are working in herds that access a variety of markets; EU, Organic, Domestic MSA, Export Grass Fed, Domestic and Export Feedlot Cattle. 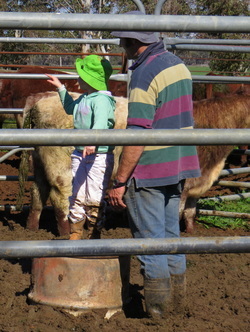 Some clients sell their calves off mum, and some grow them out to Bullock weights. Consequently we strive to produce bulls with meat quality, carcase, mid-maturity and optimum growth. At Marellan we believe that the Beef industry needs production efficient cattle with the ability to finish quickly, and fit many markets, and taste great!